John MacArthur always seems to write challenging books. Though I’m more of a Baptist than he, I appreciate MacArthur’s conservative stance on worldliness and related issues, charismatic issues, moral issues, and his love of Scripture. 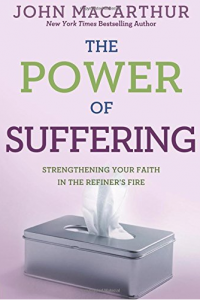 This book, written in 1995, is basically a study of several passages of Scripture having to do with suffering in the Christian life. He writes, “We tend to forget even the basic fact that all people live in a fallen world–we are sinful creatures living in a corrupt, sin-cursed society. Believers should not be suprised, perplexed, or resentful when they encounter difficulties throughout this life.” MacArthur also gives many helps on how a believer should view suffering, walk through it, and give praise to God for His faithfulness within trials.